As medical educators, we have the privilege of shaping future generations of health care providers. Just as a health care system seeks to put its patients first, a medical school should seek to put students and their educational experience squarely in focus. 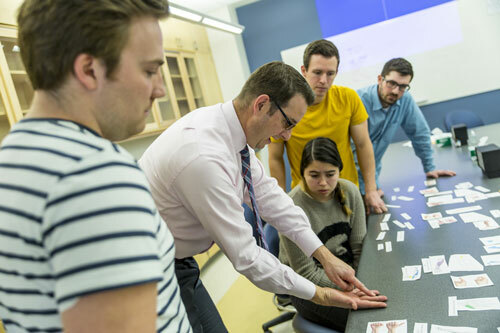 The University of Utah School of Medicine has been cultivating a community of core educators who are invested in the “exceptional learning experience.” This is vital to putting students first. Earlier this year, we gathered faculty, students, and administrators to discuss how to define and provide an exceptional learning experience. What is exceptional? We asked attendees to think back to a time when they experienced exceptional learning and to describe that experience with one word. 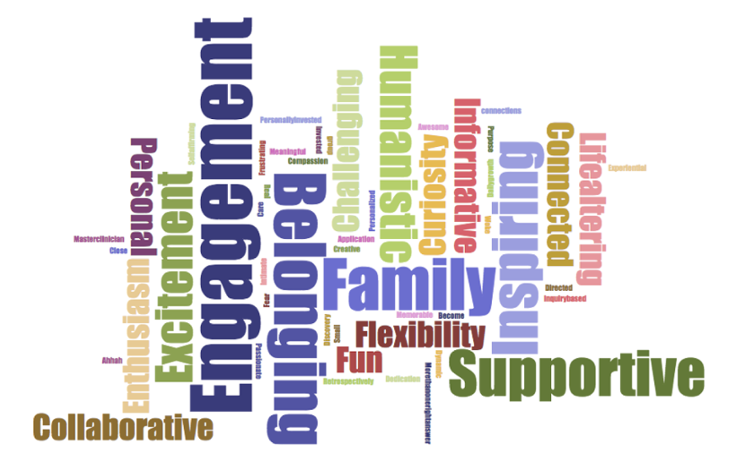 Words like “engagement,” “belonging,” “supportive,” “family,” and “inspiring” were common responses (see word cloud, below). The retreat reminded faculty of their real impact as mentors and role models for students, and for one another. Faculty mentors help students see their own value and learn to take responsibility for their own learning. Such mentors do the same for their colleagues. Few things are more rewarding than mentorship—it is a unique opportunity to help others succeed in their own careers. These are things unique to human interaction and experience, that can’t be replicated through independent study online. Feedback collected from before, during, and after the retreat revealed a lack of clarity about what a student-centered approach actually means. Students view student-centered as a learning style that is engaging, individualized, and results in higher learner satisfaction. While many core educators agree, some grapple with distinguishing between student-driven and student-centered. Because students don’t always know what they need, it’s about striking a balance that lets the learner find their niche in an environment where they will thrive. Our faculty’s focus on the exceptional learning experience is admirable, and an effort that makes the School of Medicine unique among our peers. It is rooted in genuine care and concern for our students and helps ensure we are sufficiently preparing students to enter practice professionally. Putting students first assures us that we have trained—and will continue to train—them to be compassionate, empathetic care givers who always put their patients first. Michael Good is CEO of University of Utah Health Sciences, Dean of the University of Utah School of Medicine, and A. Lorris Betz Senior Vice President for Health Sciences. 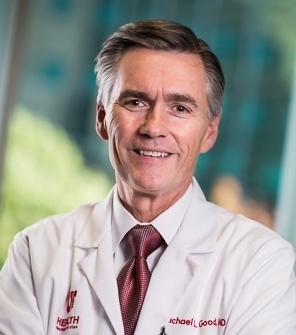 A professor of anesthesiology, Good joins the U of U Health after more than three decades of teaching, innovation, and leadership at the University of Florida, where he served as dean of the College of Medicine for 10 years.